East meets West in a unique blend of modern skyscrapers, ancient Chinese tradition, sprawling markets and outstanding food. 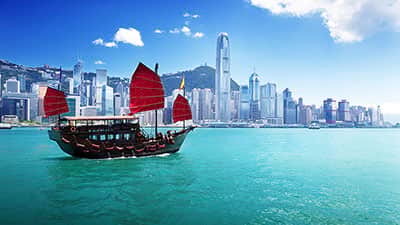 Cruise the shimmering waters of Victoria Harbour, aka Victoria Bay, situated between Hong Kong Island and Kowloon Peninsula. The largest harbour in China, Victoria Harbour bustles day and night with every manner of watercraft- from cruise lines to wooden fishing vessels. Catch the legendary Peak Tram up to Victoria View for sweeping views of the vibrant metropolis, the highest point in Hong Kong Island. Savour delicious Cantonese cooking and eat your fill of dim sums at the infamous Temple Street Night Market. Across the harbour, discover the more authentic side of Hong Kong in the chaotic markets and happening nightlife of Kowloon. Stroll the Tsim Sha Tsui East Promenade for an uninterrupted view of the skyline and have a waterside drink. For a quick escape from the hustle and bustle of the city, voyage to the calmer outlying islands. Explore traditional fishing villages in Cheung Chau Island, visit the giant Buddha in Lantau, and relax in the fine gardens and beaches of Sai Kung.